CaptiveAire offers a wide range of solutions for commercial kitchens that meet the highest code standards and offer cutting edge innovations. Clients rely on their abilities to capture and remove, as well as, make-up the right amount of air to meet their demands. With the right selection, design, & installation these units can be relied on for many years to come with proper annual maintenance. Whether you are running a small basic system or more advanced large scale units see what these systems can do for you. Let Corcoran help you for all your design, installation, maintenance, and repair needs on these systems. For help with your situation give us a call and learn why we are trusted partners in kitchen ventilation. "CaptiveAire® is the nation's leading manufacturer of commercial kitchen ventilation systems. As the industry's innovator, CaptiveAire® sets the standard for commercial kitchen ventilation equipment and service, and offers the most competitive pricing. CaptiveAire® is also known for the fastest and most reliable lead times in the industry. CaptiveAire's integrated kitchen ventilation packages include hoods, exhaust fans, electrical controls, direct-fired heaters, grease duct systems, fire suppression systems, grease filters and utility distribution systems. CaptiveAire's clients include independent restaurants, national chains, and other public and private institutions." For proper operation and efficient fuel consumption in oil, gas, and/or coal-fired heating appliances, draft must remain constant. When it is, combustion is more complete, fuels are utilized efficiently, and money is saved. When to Use These Dampers? With these devices, draft is increased or created, causing fluctuations in air flow through the combustion chamber. These fluctuations can be negated by the use of a barometric draft control located between the draft inducer or power venter and the furnace, boiler, or water heater it services. Use a single-acting control for oil and gas-fired equipment with a power vented system. Use a single acting control for oil, and a double-acting control for gas-fired equipment with a draft induced system. A power burner is designed so that a fan delivers negative air pressure to the combustion chamber. A single-acting draft control for oil maintains that negative pressure. A power burner designed to burn natural or LP gas operates in the same manner. While a draft hood (diverter) is often used on gas units fired with an atmospheric burner, a double-acting barometric draft control should be used for furnaces or boilers fired with power burners. Forced Draft installed with a stack height in excess of 30′ will probably develop excessive natural draft, reducing the amount of pressure within the furnace or boiler. A barometric draft control will help eliminate this undesirable stack action and permit the unit to be pressurized. Burners capable of burning either gaseous fuels or oil should be equipped with a barometric draft control. We suggest using a double-acting control on units where fuels are frequently changed. The double-acting feature is important for gas-firing appliances because it allows spillage of combustion products in case of blocked flues or downdrafts. To detect flue gas spillage on dual fuel installation, a Field Thermal Safety Switch is recommended. Gas-fired furnaces and boilers generally require a double-acting draft control. Like a single-acting control, it opens inwardly to maintain a uniform draft. But, unlike a single-acting control, it is also free to open outwardly to spill the products of combustion, in case of blocked flues or downdrafts. National codes often mandate the use of a draft control. Usage is generally limited to furnaces or boilers designed for use with power burners and incinerators. Draft controls are generally used when oil-fired units are converted to gas. 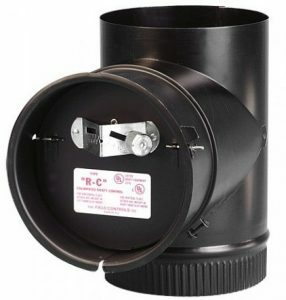 These models are designed to provide combustion air for appliances when direct connection to the burner is not possible (when the appliance is located in a confined space). According to NFPA 54 and NFPA 31, an engineered system such as a CAS-3, 4, 6 or 7 may be used to overcome the lack of air in a confined space. The CAS-3 is designed for use with oil appliances. The CAS-4 is for use with gas appliances with 24 VAC gas valve controls. The CAS-4MV is for use with 750mV power pile gas appliances. Each is designed for optimum safety and includes a proving device that won’t allow the burner to engage without the Fan-in-a-Can® operating. Multiple units or additional controls are required for multiple appliance installations. Each is equipped with a two speed control for enhanced versatility. How The CAS (Fan-in-a-can) works: When the thermostat calls for heat, the Fan-in-a-Can® engages and begins drawing air into the structure. When air flow is established, the pressure switch closes. The CAS sends a signal to the appliance, allowing the burner to fire. The Fan-in-a-Can® diffuses the outside air into the room near the burner to ensure adequate air for efficient combustion. Why Make Up Air Systems? To improve Indoor Air Quality. To increase fresh air changes. 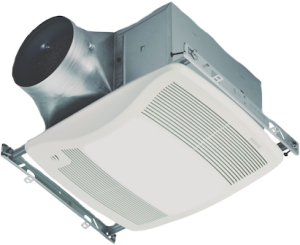 To replace air exhausted by bathroom fans, laundry dryers, range hood fans and other exhaust devices. 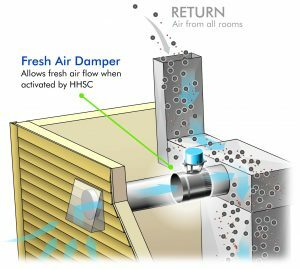 How It Works: The Make-Up Air System connects the HVAC system to the outside to allow controlled amounts of fresh air to enter the system when needed. 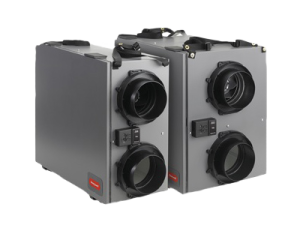 The system automatically senses pressure changes and a need for air flow and opens to bring a precise, metered amount of fresh air into the air handler. Here the cold air is tempered as it mixes with warm air in the return duct. The air is then heated and distributed through the home via the central duct system. When the need for air is fulfilled, the system closes to prevent further air infiltration. The system must be installed by a qualified heating and air conditioning professional and is adjustable for homes from 1000 to 4000 square feet. It does not require any electricity or maintenance. Homes are now built much more efficiently than they once were, making them far less costly to heat and air condition. That said, having proper ventilation throughout the home is now imperative in order to provide a safe and comfortable living environment. 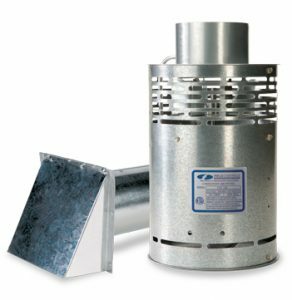 BROAN ventilation fans provide the best solutions to ensure that contaminants are constantly removed from the indoors. High quality BROAN ventilation fans offer a variety of performance levels, functionalities and styles to suit each need in any area of your home. With air movement, sound levels and ENERGY STAR® qualified efficiency certified by the Home Ventilating Institute (HVI), you can trust that BROAN fans will serve at every level. BROAN fans function as BOTH traditional bath fan for removing humidity and odors on the spot, AND as continuously running fan to constantly remove contaminants trapped throughout the home. Problems such as humidity, odors, dust, pet dander, and various chemicals will be eliminated. This type of ventilation is referred to as “whole house” and is increasingly being required to meet building codes or to meet the requirements of green building programs such as LEED, ENERGY STAR® for Homes or the National Green Building Standard.